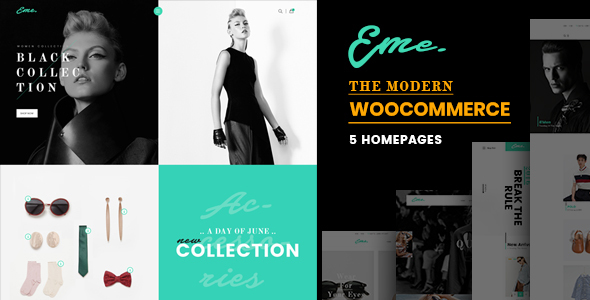 Eme – WooCommerce WordPress Theme is an amazing and a responsive WooCommerce website theme. Eme is a complete solution for creating powerful online shop website without any coding. The theme is perfect for men & women fashion, children fashion, and cloth selling. It is built based on the fastest KingComposer- Page Builder. This responsive WordPress theme has Responsive Layouts with Preset Page Layouts. You can customize them with ease using Drag & Drop Page Builder. This WooCommerce theme is entirely customizable and flexible. It offers full customizations, such as Header, Footer, Logo, Menu, Button, and Other Options. Moreover, there are 5+ Homepage and numerous Inner pages. Mobile-friendly theme Eme grants a healthy feature list for commercial purposes. It is built-in commercial features powered by WooCommerce that’s why your products do the talking. Theme Layout is available in Full Width and Boxed. Even layouts for shops and products are also possible to customize. Promote with the Shop pages like On Sale, Best Selling Products, Top Rated Products, and Featured Products. Equally you can have Products pages, such as Simple Product, Variable Product, Bundle Product, Group Product, and Affiliate Link Product. So, marketing of your products is so simple and fast with Eme – WooCommerce WordPress Theme. If the user wants more extensive customization, the powerful theme page builder can fulfill that need. Eme WordPress Theme is truly flexible theme and full of functionality with a set of diverse features, tools, widgets, shortcodes, and powerful plugins support. Besides that, 40+ KingComposer add-ons and 20+ Eme Custom add-ons are included for smooth integration. However, the main focus of Eme is on performance, reliability, and easiness of use. You will get Smooth Scroll, Carousel, Material Design Icon, Google Fonts, and Unlimited Color for Design & Content Elements. It also features different sections for attracting viewers. Some other features that need to be highlighted are WPML Compatibility, Ajax Search, Ajax Add to Cart, My Account, Wishlist, Blog, Checkout, and so on. Customer contact is also at your disposal with contact forms because it is optimized for Contact Form 7. Eme comes with support, documentation, and WooCommerce compatibility. Never worry about the browser compatibility again. Maintain a wide range of your professional website across the multi-browser. This SEO-friendly theme is effectively full cross-browser compatible. Eme – WooCommerce WordPress Theme packs everything you need to take your business to the next level. Try this awesome theme and get your dream business started!